Kisan Baburao Hazare pronunciation (help·info) (Marathi: किसन बापट बाबुराव हजारे, Kisan Bāpat Bāburāv Hajārē ?) (born 15 June 1937), popularly known as Anna Hazare pronunciation (help·info) (Marathi: अण्णा हजारे, Aṇṇā Hajārē ?) is an Indian social activist and a prominent leader in the 2011 Indian anti-corruption movement, using nonviolent methods following the teachings of Mahatma Gandhi. Hazare also contributed to the development and structuring of Ralegan Siddhi, a village in Parner taluka of Ahmednagar district, Maharashtra, India. He was awarded the Padma Bhushan—the third-highest civilian award—by the Government of India in 1992 for his efforts in establishing this village as a model for others. Anna Hazare started an indefinite hunger strike on 5 April 2011 to exert pressure on the Indian government to enact a stringent anti-corruption law as envisaged in the Jan Lokpal Bill, for the institution of an ombudsman with the power to deal with corruption in public places. The fast led to nation-wide protests in support of Hazare. The fast ended on 9 April 2011, a day after the government accepted Hazare's demands. The government issued a gazette notification on the formation of a joint committee, consisting of government and civil society representatives, to draft the legislation. For the year 2011 Foreign Policy magazine has named him among top 100 global thinkers. Anna has been ranked as the most influential person inMumbai by a national daily newspaper. He has faced criticism for his authoritarian views on justice, including death as punishment for corrupt public officials and his alleged support for forced vasectomies as a method of family planning. Kisan Hazare was born on 15 June 1937 (some sources say 1940) in Bhingar, near to Ahmednagar. The eldest son, with two sisters and four brothers, the later adoption of the nameAnna reflects the Indian word for "elder brother". His father worked in a pharmacy and struggled to support the family financially. In time, the family moved to their ancestral village of Ralegan Siddhi, where they owned a small amount of agricultural land. A relative took on the burden of providing Kisan with an education, taking him to Mumbai because the village had no primary school. The relative became unable financially to continue the support and Kisan's schooling ended in the Standard Seventh grade; his siblings were not schooled at all. He started selling flowers at the Dadar railway station in Mumbai and was able eventually to own two flower shops in the city. He also became involved in vigilantism, joining groups who acted to prevent the poor from being bullied out of their shelters by thugs in the employ of landlords. The Indo-China War of 1962 caused the Indian Army to commence emergency recruitment measures. Hazare was recruited in April 1963, despite not meeting the physical requirements, and was attested as a soldier on 16 November of that year after undertaking training at Aurangabad. During the Indo-Pakistani War of 1965, Hazare was posted at the border in the Khem Karan sector. He was the sole survivor of an enemy attack - variously claimed to have been a bomb, an aerial assault and an exchange of fire at the border - while he was driving a truck. The experiences of war time, coupled with the poverty from which he had come, affected him. He had considered suicide at one point but now turned to pondering the meaning of life and death. He has said of the truck attack that "[It] sent me thinking. I felt that God wanted me to stay alive for some reason. I was re-born in the battlefield of Khem Karan. And I decided to dedicate my new life to serving people." He spent his spare time reading the works of Swami Vivekananda, Gandhi, and Vinoba Bhave. In a blog post, Hazare expressed his views on Kashmir by saying that it was his "active conviction that Kashmir is an integral part of India" and that if required once again for service, he would remain "ready to take part in war against Pakistan." During the mid-1970s, Hazare survived a road accident while driving for the army. He interpreted his survival as a further sign that his life was intended to be dedicated to the service of the community. Despite subsequent allegations that he had deserted from the army, official records show that he was honourably discharged in 1975 after completing his 12 years of service. Hazare returned to Ralegan Siddhi, a village described by Satpathy and Mehta as being then "one of the many villages of India plagued by acute poverty, deprivation, a fragile ecosystem, neglect and hopelessness." Although most of the villagers owned some land, cultivation was extremely difficult due to the rocky ground preventing retention of the monsoon rains; this situation had not been assisted by a gradual deterioration as trees were cut down, erosion spread and droughts were also experienced. The shortage of water also led to disease because conditions became unsanitary and water was re-used for multiple purposes. The economy of the village had become reliant on illegal manufacture and sale of alcohol, a product to which many of the villagers had themselves become addicted. Many inhabitants were at the mercy of moneylenders in order to survive, and those lenders would charge monthly interest rates of as much as 10%. Crime and violence (including domestic violence) had become commonplace, while education and employment opportunities were poor. Hazare was relatively wealthy because of the gratuity from his army service. He set about using that money to restore a run-down, vandalised village temple as a focal point for the community. Some were able to respond with small financial donations but many other villagers, particularly among the elderly, donated their labour in a process that became known as shramdaan. Some youths also became involved in the work and these he organised into a Tarun Mandal (Youth Association). One of the works of Vivekananda which he had read was Call to the youth for nation building. Hazare and the youth group decided to take up the issue of alcoholism as a means to drive a process of reform. At a meeting conducted in the temple, the villagers resolved to close down liquor dens and ban alcohol in the village. Since these resolutions were made in the temple, they became, in a sense, religious commitments. Over thirty liquor brewing units were closed by their owners voluntarily. Those who did not succumb to social pressure were forced to close down their businesses when the youth group smashed up their liquor dens. The owners could not complain as their businesses were illegal. Doesn’t a mother administer bitter medicines to a sick child when she knows that the medicine can cure her child? The child may not like the medicine, but the mother does it only because she cares for the child. The alcoholics were punished so that their families would not be destroyed. Hazare appealed to the government of Maharashtra to bring in a law whereby prohibition would come into force in a village if 25% of the women in the village demanded it. In 2009 the state government amended the Bombay Prohibition Act, 1949 to reflect this. It was decided to ban the sale of tobacco, cigarettes, and beedies (an unfiltered cigarette where the tobacco is rolled in tendu also known as Diospyros melanoxylon leaves instead of paper) in the village. In order to implement this resolution, the youth group performed a unique "Holi" ceremony twenty two years ago.[when?] The festival of Holi is celebrated as a symbolic burning of evil. The youth group brought all the tobacco, cigarettes, and beedies from the shops in the village and burnt them in a Holi fire. Tobacco, cigarettes, or beedies are no longer sold. In 1980, the Grain Bank was started by him at the temple, with the objective of providing food security to needful farmers during times of drought or crop failure. Rich farmers, or those with surplus grain production, could donate a quintal to the bank. In times of need, farmers could borrow the grain, but they had to return the same amount of grain they borrowed, plus an additional quintal as an interest. This ensured that nobody in the village ever went hungry or had to borrow money to buy grain. This also prevented distress sales of grain at lower prices at harvest time. Ralegan is located in the foothills, so Hazare persuaded villagers to construct a watershed embankment and associated works to stop water and allow it to percolate and increase the ground water level and improve irrigation in the area. These efforts solved the problem of water scarcity in the village and made irrigation possible. Cultivation of water-intensive crops like sugar cane was banned. Crops such as pulses, oil-seeds, and certain cash crops with low water requirements were grown. The farmers started growing high-yield varieties of crop and the cropping pattern of the village was changed. Hazare has helped farmers of more than 70 villages in drought-prone regions in the state of Maharashtra since 1975.When Hazare came in Ralegan Siddhi in 1975 only 70 acres (28 ha) of land was irrigated, Hazare converted it into about 2,500 acres (1,000 ha). As a secondary occupation, milk production was promoted in Ralegan Siddhi. Purchase of new cattle and improvement of the existing breed with the help of artificial insemination and timely guidance and assistance by a veterinarian resulted in an improvement in the cattle stock, increasing production of milk. Crossbred cows are replacing local ones which gave a lower milk yield. In 1932, Ralegan Siddhi got its first formal school, a single classroom primary school. [clarification needed] In 1962, the villagers added more classrooms through community volunteer efforts. By 1971, out of an estimated population of 1,209, only 30.43% were literate (72 women and 290 men). Boys moved to the nearby towns of Shirur and Parner to pursue higher education, but due tosocioeconomic conditions, girls could not do the same and were limited to primary education. Hazare, along with the youth of Ralegan Siddhi, worked to increase literacy rates and education levels. In 1976 they started a pre-school and a high school in 1979. The villagers formed a charitable trust, the Sant Yadavbaba Shikshan Prasarak Mandal, which was registered in 1979. The social barriers and discrimination that existed due to the caste system in India have been largely eliminated by Ralegan Siddhi villagers. It was Hazare's moral leadership that motivated and inspired the villagers to shun untouchability and caste discrimination. Marriages of Dalits are held as part of community marriage program together with those of other castes. The Dalits have been integrated into the social and economic life of the village. The upper caste villagers have built houses for the lower caste Dalits by shramdaan and helped to repay their loans to free them from their indebtedness. Most rural poor get into a debt trap as they incur heavy expenses at the time of marriage of their daughter or son. It is an undesirable practice but has almost become a social obligation in India.Ralegan's people have started celebrating marriages collectively. Joint feasts are held, where the expenses are further reduced by the Tarun Mandal taking responsibility for cooking and serving the food. The vessels, the loudspeaker system, the mandap, and the decorations have also been bought by the Tarun Mandal members belonging to the oppressed castes. From 1976 to 1986, 424 marriages have been held under this system. The Gandhian philosophy on rural development considers the Gram Sabha as an important democratic institution for collective decision making in the villages of India. Hazare campaigned between 1998 and 2006 for amending the Gram Sabha Act, so that the villagers have a say in the development works in their village. The state government initially refused, but eventually gave in due to public pressure. As per the amendments, it is mandatory to seek the sanction of the Gram Sabha (an assembly of all village adults, and not just the few elected representatives in the gram panchayat) for expenditures on development works in the village. Anna Hazare listening to the problems of people at Nanded, Maharashtra. In 1991 Hazare launched the Bhrashtachar Virodhi Jan Aandolan (BVJA) (People's Movement against Corruption), a popular movement to fight against corruption in Ralegaon Siddhi. In the same year he protested against the collusion between 40 forest officials and timber merchants. This protest resulted in the transfer and suspension of these officials. In May 1997 Hazare protested against alleged malpractices in the purchase of powerlooms by the Vasantrao Naik Bhathya Vimukt Jhtra Governor P. C. Alexander. On 4 November 1997 Gholap filed a defamation suit against Hazare for accusing him of corruption. He was arrested in April 1998 and was released on a personal bond of 5,000 (US$100). On 9 September 1998 Hazare was imprisoned in the Yerawada Jail to serve a three-month sentence mandated by the Mumbai Metropolitan Court. The sentencing caused leaders of all political parties except the BJP and the Shiv Sena came in support of him. Later, due to public protests, the Government of Maharashtra ordered his release from the jail. After release, Hazare wrote a letter to then chief minister Manohar Joshi demanding Gholap's removal for his role in alleged malpractices in the Awami Merchant Bank. Gholap resigned from the cabinet on 27 April 1999. In 2003 corruption charges were raised by Hazare against four NCP ministers of the Congress-NCP government. He started his fast unto death on 9 August 2003. He ended his fast on 17 August 2003 after then chief minister Sushil Kumar Shinde formed a one-man commission headed by the retired justice P. B. Sawant to probe his charges.The P. B. Sawant commission report, submitted on 23 February 2005, indicted Sureshdada Jain, Nawab Malik, and Padmasinh Patil. The report exonerated Vijaykumar Gavit. Suresh Jain and Nawab Malik resigned from the cabinet in March 2005. Three trusts headed by Anna Hazare were also indicted in the P. B. Sawant commission report. 220,000 (US$4,180) spent by the Hind Swaraj Trust for Anna Hazare's birthday celebrations was concluded by the commission as illegal and amounting to a corrupt practice, though Abhay Firodia, an industrialist subsequently donated 248,000 (US$4,710) to the trust for that purpose.The setting apart of 11 acres of its land by the trust in favour of the Zilla Parishad without obtaining permission from the charity commissioner was concluded as a case of maladministration. The commission also concluded that the maintenance of accounts of the Bhrashtachar Virodhi Janandolan Trust after 10 November 2001 had not been according to the rules and 46,374 (US$880) spent by the Sant Yadavbaba Shikshan Prasarak Mandal Trust for renovating a temple was in contravention to its object of imparting secular education. In the early 2000s Hazare led a movement in Maharashtra state which forced the state government to enact a revised Maharashtra Right to Information Act. This Act was later considered as the base document for the Right to Information Act 2005 (RTI), enacted by the Union Government. It also ensured that the President of India assented to this new Act. On 20 July 2006 the Union Cabinet amended the Right to Information Act 2005 to exclude the file noting by the government officials from its purview. Hazare began his fast unto death on 9 August 2006 in Alandi against the proposed amendment. He ended his fast on 19 August 2006, after the government agreed to change its earlier decision. Before 2006 in the state of Maharashtra, even honest government officers were transferred to other places according to ministers wish. Sometimes within months of being posted to a place, whereas some corrupt and favoured officials were cozy in their postings for many years in some cases even for 10 to 20 years and since there was not any guideline or law many government officials were reluctant to process files that contained important public proposals and decisions. Anna fought hard for a law whereby a government servant must clear a file within a specified time and that transfers must take place only after three years. After many years of relentless efforts of Anna, finally on 25 May 2006 state government of Maharashtra issued a notification announcing that the execution of the special act, The Prevention of Delay in Discharge of Official Duties Act 2006, aimed at curbing the delay by its officers and employees in discharging their duties. This act provides for disciplinary action against officials who move files slowly and enables monitoring officials who stay too long in a post, or in a department, and for involvement in a corrupt nexus. Within this act, it is mandatory for the government to effect transfers of all government officers and employees, except Class IV workers, after the stipulated three years. Act also prevents the government from effecting frequent transfers of officers before the stipulated three-year tenure, except in case of emergency and under exceptional circumstances. Maharashtra is the first state in the country to have introduced such act.However, like others, this law has also not been followed in its true spirit. Constitution of India Article 47 commits the State to raise the standard of living and improve public health, and prohibit the consumption of intoxicating drinks and drugs injurious to health. In 2007 Maharashtra Government rolled out the grain-based liquor policy aimed to encourage production of liquor from food grain in the light of the rising demand for spirit – used for industrial purposes and potable liquor and Issue 36 licenses for distilleries for making alcohol from food grains. Anna Hazare opposed the governments policy to promote making liquor from food grains in Maharashtra. He argued the government that Maharashtra is a food-deficit State and there was shortage of food grains and it is not logical to promote producing liquor from food grains. One of the State ministers Laxman Dhoble said in his speech that those opposing the decision to allow use of food grains for the production of liquor are anti-farmers and those people should be beaten up with sugarcane sticks. Hazare initiated fast at Shirdi, but on 21 March 2010 government promised to review the policy and Anna ended his 5 day long fast. But the government later granted 36 licences and grants of 10 (US$0.19) (per litre of alcohol) to politicians or their sons who were directly or indirectly engaged in making alcohol from foodgrains. Some of the main beneficiaries of these licences includes Amit and Dheeraj Deshmukh, sons of Union Heavy Industries Minister Vilasrao Deshmukh, Bharatiya Janata Party leader Gopinath Munde's daughter Pankaja Palwe and her husband Charudatta Palwe, sons-in-law of P.V. Narasimha Rao, Rajya Sabha MP Govindrao Adik. The government approved the proposal for food grain-based alcohol production in spite of stiff opposition from the planning and finance departments saying there is a huge demand in other countries for food grain made liquor in comparison with that of molasses. Anna filed a Public Interest Litigation against the Government of Maharashtra for allowing food-grains for manufacturing liquor in the Nagpur bench of the Bombay High Court. On 20 August 2009 Maharashtra government stopped the policy. However, distilleries sanctioned before that date and those who started production within two years of sanction were entitled for subsidies. On 5 May 2011 court refused to hear a Public Interest Litigation saying "not before me, this is a court of law, not a court of justice" as a reason of not hearing the plea. One of Principal Secretary in Maharashtra state C.S. Sangeet Rao, enlighten that there is no law exists to scrap these licences as this is a government policy. 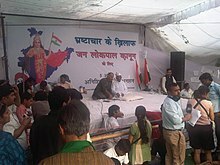 Anna Hazare's hunger strike at Jantar Mantar in New Delhi. In 2011, Hazare initiated a Satyagraha movement for passing a stronger anti-corruption Lokpal (ombudsman) bill in the Indian Parliament as conceived in theJan Lokpal Bill (People's Ombudsman Bill). The Jan Lokpal Bill was drafted earlier by N. Santosh Hegde, former justice of the Supreme Court of India andLokayukta of Karnataka, Prashant Bhushan, a senior lawyer in the Supreme Court and Arvind Kejriwal, a social activist along with members of the India Against Corruption movement. This draft bill incorporated more stringent provisions and wider power to the Lokpal (Ombudsman) than the draft Lokpal bill prepared by the government in 2010. These include placing "the Prime Minister within the ambit of the proposed lokpal’s powers". Wikinews has related news:Anna Hazare begins "fast-unto-death" hunger strike to end corruption. Hazare began his Indefinite Fast on 5 April 2011 at Jantar Mantar in Delhi to press for the demand to form a joint committee of the representatives of the Government and the civil society to draft a stronger anti-corruption bill with stronger penal actions and more independence to the Lokpal and Lokayuktas (Ombudsmen in the states), after his demand was rejected by the Prime Minister of India Manmohan Singh. He stated, "I will fast until Jan Lokpal Bill is passed". The movement attracted attention in the media, and thousands of supporters. Almost 150 people reportedly joined Hazare in his fast. Social activists, including Medha Patkar, Arvind Kejriwal, former IPS officer Kiran Bedi, and Jayaprakash Narayan lent their support to Hazare's hunger strike and anti-corruption campaign. People have shown support in internet social media such as Twitter and Facebook. In addition to spiritual leaders Sri Sri Ravi Shankar,Swami Ramdev, Swami Agnivesh and former Indian cricketer Kapil Dev, many celebrities showed their public support through Twitter. Hazare decided that he would not allow any politician to sit with him in this movement. Politicians like Uma Bharti and Om Prakash Chautala were shooed away by the protesters when they came to visit the site where the protest was taking place. On 6 April 2011 Sharad Pawar resigned from the group of ministers formed for reviewing the draft Lokpal bill 2010. 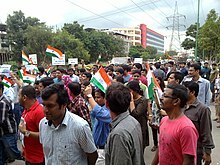 Protests spread to Bangalore, Mumbai, Chennai, Ahmedabad, Guwahati, Shillong, Aizawl and a number of other cities in India. On 8 April 2011 the Government of India accepted all demands of the movement. On 9 April 2011 it issued a notification in the Gazette of India on formation of a joint committee. It accepted the formula that there be a politician Chairman and an activist, non-politician Co-Chairman. According to the notification, Pranab Mukherjee will be the Chairman of the draft committee while Shanti Bhushan will be the co-chairman. “The Joint Drafting Committee shall consist of five nominee ministers of the Government of India and five nominees of the civil society. The five nominee Ministers of the Government of India are Pranab Mukherjee, Union Minister of Finance, P. Chidambaram, Union Minister of Home Affairs, M. Veerappa Moily, Union Minister of Law and Justice, Kapil Sibal, Union Minister of Human Resource and Development and Minister of Communication and Information Technology and Salman Khursheed, Union Minister of Water Resources and Minister of Minority Affairs. The five nominees of the civil society are Anna Hazare, N. Santosh Hegde, Shanti Bhushan Senior Advocate, Prashant Bhushan, Advocate and Arvind Kejriwal. On the morning of 9 April 2011 Hazare ended his 98-hour hunger strike. He addressed the people and set a deadline of 15 August 2011 to pass the Lokpal Bill in the Indian Parliament. "Real fight begins now. We have a lot of struggle ahead of us in drafting the new legislation, We have shown the world in just five days that we are united for the cause of the nation. The youth power in this movement is a sign of hope." Anna Hazare said that if the bill does not pass he will call for a mass nation-wide agitation. He called his movement as "second struggle for independence" and he will continue the fight. During the meeting of the joint drafting committee on 30 May 2011, the Union government members opposed the inclusion of the prime minister, higher judiciary and the acts of the MPs under the purview of the Lokpal in the draft bill. On 31 May 2011, Pranab Mukherjee, chairman of the joint drafting committee sent a letter to the chief ministers of all states and the leaders of the political parties seeking their opinion on six contentious issues in the proposed Lokpal Bill, including whether to bring the prime minister and judges of Supreme Court and High Courts under the purview of the proposed law. But the civil society members of the drafting committee considered that keeping the prime minister and judges of Supreme Court and High Courts out of the purview of the Lokpal would be a violation of the United Nations Convention against Corruption. Anna Hazare and other civil society members decided to boycott the meeting of the joint Lokpal Bill drafting committee scheduled on 6 June 2011 in protest against the forcible eviction of Swami Ramdev and his followers by the Delhi Police from Ramlila Maidan on 5 June 2011, while they were on hunger strike against the issues of black money and corruption and doubting seriousness of the government in taking measures to eradicate corruption. On 6 June 2011, the members of the civil society of the joint Lokpal bill drafting committee in New Delhi sent a letter to Pranab Mukherjee, the chairman of the committee, explaining reasons for their absence at the meeting and also asked government to make its stand public on the contentious issues related to the proposed draft legislation. They also decided that the future meetings will be attended only if they were telecast live. On 8 June 2011 at Rajghat, describing his movement as the second freedom struggle, Anna criticised the Government for trying to discredit the joint Lokpal Bill drafting committee and threatened to go on indefinite fast again from 16 August 2011 if the Lokpal Bill is not passed by then. He also criticised the Government for putting hurdles in the drafting of a strong Lokpal Bill and its attempts to malign the civil society members of the joint Lokpal panel. India Against Corruption campaign in Whitefield, Bangalore. On 28 July 2011 the union cabinet on approved a draft of the Lokpal Bill, which keeps the Prime Minister, judiciary and lower bureaucracy out of the ambit of the proposed corruption ombudsman Lokpal. Hazare rejected the government version by describing it as “cruel joke’’ and wrote a letter to Prime MinisterManmohan Singh, and told him his decision to go on an indefinite fast from 16 August 2011 at Jantar Mantar if the government introduced its own version of the bill in Parliament without taking suggestions from civil society members. Why are you (government) sending the wrong draft? We have faith in Parliament. But first send the right draft, our agitation is against government, not Parliament. The government has overlooked many points. How will it fight corruption by excluding government employees, CBI and prime minister from the Lokpal's purview? We were told that both the drafts would be sent to the Cabinet. But only the government's draft was sent. This is a deceitful government. They are lying. How will they run the country? Now I have no trust in this government. If it is really serious about fighting corruption, why is it not bringing government employees and CBI under Lokpal? Within twenty four hours of cabinet's endorsement of a weak Lokpal Bill, over ten thousand peoples from across the country sent faxes directly to the government demanding a bill with stronger provisions. The Mumbai Taxi Men’s Union, comprises over 30,000 taxi drivers have extended their full support to Hazare’s fast by keeping all taxis off the roads on 16 August 2011. Lawyers of Allahabad High Court described Lokpal Bill proposed by the government as against the interest of the country and pledged their support to Hazare by hunger strike at Allahabad on 16 August 2011. On 30 July 2011 Vishwa Hindu Parishad supported Hazare's indefinite fast by saying movement for an effective anti-corruption ombudsman needs the backing of people. On 1 August, Public interest litigation was filed in the Supreme Court of India by Hemant Patil, a Maharashtra-based social worker and businessman, to restrain Hazare from going on his proposed indefinite fast. The petitioner demanded to prohibit the fast alleging that Hazare's demands are unconstitutional and amount to interference in legislative process. Wikinews has related news:Anna Hazare to resume "fast-unto-death" hunger strike from August 16, 2011. On 16 August 2011, Hazare was arrested four hours before the planned indefinite hunger strike. Rajan Bhagat, spokesman for Delhi Police, said police arrested Hazare under a legal provision that bans public gatherings and protests at the park in Delhi where he was planning to begin his hunger strike. Police took that action after Hazare refused to meet the conditions put forward by police for allowing the protest. The conditions included restricting the length of the fast to three days and the number of protesters at the site to 5,000. Later in the afternoon, Anna was produced before a magistrate who offered him bail but Anna Hazare refused to provide the bail bond. The magistrate sent him judicial custody for seven days and he was taken to Tihar jail. After announcements by Prashant Bhushan, local television, and social media sites (including Facebook), a march of thousands in support of Hazare began from the India Gate to Jantar Mantar. Along with Hazare, other key members of the India Against Corruption movement including Arvind Kejriwal, Shanti Bhushan, Kiran Bedi and Manish Sisodia were also detained from different locations. It was reported that about 1,300 supporters were detained in Delhi. Media also reported that the arrest sparked off protests with people courting arrests in different parts of the country. The opposition parties in the country came out against the arrest, likening the government action to the emergency imposed in the country in 1975. Both the houses of Parliament were adjourned over the issue. Eventually, after being kept in judicial detention for just four hours, he was released unconditionally without any bail bond by the magistrate on a request by the police, but Hazare refused to leave Tihar Jail. He demanded an unconditional permission from the police to observe a fast at Ramlila Maidan (Ground) in support of the Jan Lokpal bill and refused to leave the jail. Hazare continued his fast inside the jail and refused to leave the jail though the jail authorities had technically released him. After his arrest, Anna Hazare received support from people across the country. There were reports of "nearly 570 demonstrations and protests by Anna supporters across the country" against the government's imprisonment of Hazare and others. Due to the nationwide protests of millions, the government agreed to allow him to begin a public hunger strike of fifteen days. After talks with public authorities, Hazare decided to hold his protest at Ramlila Maidan, New Delhi. On 20 August 2011 Hazare "left the Tihar Jail for the Ramlila Grounds". Hazare promised reporters "he would fight to the 'last breath' until the government gets his team's Jan Lokpal Bill passed in this session of Parliament, which ends on 8 September." Anna Hazare on fast unto death protest. He was admitted to Medanta Medicity, Gurgaon for post-fast care. He had lost 7.5 kg and was very dehydrated after the 288 hour long fast. Within a few days of Anna Hazare's first fast demanding a strong Lokpal (on 5 April 2011), supporters across various cities of India started a campaign known as "I Am Anna Hazare", which is similar to the "We Are All Khaled Said" campaign well known in the Egyptian uprising. At during Anna Hazare's second fast, the topi, the cap which Anna Hazare became synonymous with, became almost a fashion statement. Sales of the topis hit an all time high. Kiran Bedi declared that the "I am Anna" topi should be used as a deterrence method whenever someone asked for a bribe. She went to say that the topi should be always kept in one's bag and whenever anybody ask for a bribe, the topi should be shown to them. On 27 December 2011, Hazare began a 3 day hunger strike at MMRDA grounds, Bandra Kurla Complex in demand to a stronger version of the Lokpal bill than the is in debate in the Parliament of India. Hazare ended the fast on 28 December 2011, after his doctors said that his kidneys might fail if he continued his fast. Before reaching the venue, Anna payed his tributes to Mahatma Gandhi at Juhu Beach. On his way in a rally, which was joined by several thousand people, he took two-and-half hours to reach the ground, passing through Santacruz, Tulip Star Hotel, Mithibai College, SV Road, Vile Parle, Khar and Bandra Highway. Reiterating Anna Hazare's position, a PIL petition filed against the fast was turned down by the Karnataka High Court. A judge also noted that there was no public interest in the petition. In 2011, Anna Hazare demanded an amendment to the electoral law to incorporate the option of None of the above in the electronic voting machines during the Indian elections. The "None of the above (NOTA)" is a ballot option that allows an electorate to indicate disapproval of all of the candidates in an electoral system, in case of non-availability of any candidate of his choice, as hisRight to Reject. Soon, the Chief Election Commissioner of India Shahabuddin Yaqoob Quraishi supported Hazare's demand for the electoral reforms. On 8 June 2011, Anna Hazare and thousands of his supporters observed fast from 10 am to 6 pm at Rajghat to protest against the midnight crackdown of 5 June 2011 by the Delhi Police on Swami Ramdev’s fast at Ramlila Maidan, New Delhi. The fast was initially planned to be held at Jantar Mantar, but the venue was shifted after the denial of permission by the Delhi police. Anna Hazare held the Prime Minister of India responsible for the atrocities and termed the police action as a blot on humanity and an attempt to stifle democracy. According to one of the Anna's young supporters, the large presence of youths in the protest was due to their support to his use of nonviolence means of protest similar to Gandhi. Anna Hazare has often being criticized for being an agent of Rashtriya Swayamsevak Sangh a right-wing Hindu body in India. United Progressive Alliance,the present ruling government in Indiahas seldom charged Hazare with it. According to Digvijay Singh a senior leader of the Indian National Congress the entire crusade of 2011 Indian anti-corruption movement is a process being planned by Rashtriya Swayamsevak Sangh in which Plan-A was Baba Ramdev while Plan-B was Anna Hazare. Their basic job was to disturb the national security of the country. Further Digvijay Singhhad charged Anna Hazare for having links with late Rashtriya Swayamsevak Sangh leader Nanaji Deshmukh with whom he worked as a secretary. However Anna has declined for having any such associations. In a press conference in April 2011, Anna Hazare praised Narendra Modi, the chief minister of Gujarat for his efforts on rural development along with Nitish Kumar, chief minister of Bihar, saying that the same should be emulated by the chief ministers of all states. Subsequently, Modi wrote an open letter to him, hailing him as a Gandhian and anti-corruption activist while Digvijay Singh, the General Secretary of the Congress party, criticised him for his comment. In May 2011, Hazare, during his visit to Gujarat, changed his view and criticised Modi for rampant corruption by Government officials in Gujarat. He urged Modi to appoint a Lokayukta in Gujarat. He also commented that the media had projected an incorrect image of Vibrant Gujarat, very different from the prevalent situation. A cardiologist from Pune, Abhijit Vaidya – founder of Arogya Sena, a non-governmental agency active in public health, disaster management and social campaigns – claimed that he was informed by the close associates of Anna Hazare during a fast in Ralegan-Siddhi, that he was given glucose and electrolyte solutions during a fast. Hazare and his associates refused to comment on the allegation. The government of the state of Maharashtra instituted a Commission of Inquiry under Justice PB Sawant in September 2003 to enquire into allegations of corruption against several people, including four ministers in the state as well as the "Hind Swaraj Trust" headed by Hazare. The Commission submitted its report on 22 February 2005 in which it indicted the Hind Swaraj Trust for corrupt practice of spending Rs. 2.20 lakhs of its funds on the birthday celebrations of Hazare. Two days ahead of Hazare's proposed indefinite fast on 16 August 2011, the ruling party of India, the Indian National Congress, launched an attack on him alleging that "the moral core of Hazare has been ripped apart" by the Justice P B Sawant Commission. In response to this allegaton, Hazare's lawyer Milind Pawar, claimed that the commission had remarked about "irregularities" in the accounts, but had not held him guilty of any "corrupt" practices. Pawar said that on 16 June 1998, a celebration was organised to facilitate Hazare on winning an award from a US based NGO and it coincided with his 61st birthday. The trust spent Rs 2.18 lakh for the function. Abhay Phirodia, a Pune-based industrialist, who took the initiative to organise this function donated an amount of Rs 2,48,950 to the trust by cheque soon after the function. Hazare himself responded to the allegation by daring the government to file a First Information Report (FIR) against him to prove the charges. An article written in The Telegraph (Kolkata) by writer and historian Ramchandra Guha state that that environmental journalist Mukul Sharma found that that Anna Hazare forced the Dalit families in Ralegan Siddhi to adopt a vegetarian diet, and that those who violated the decree were tied to a post and flogged. Mukul Sharma also found that no panchayat elections have been held in the village for the past two decades, and that no campaigning was allowed during state and national elections, upon the instructions of Anna Hazare. Dalit columnists like Chandrabhan Prasad have opined that the movement initiated by Anna Hazare against corruption and for the Jan Lokpal bill is taking us to a situation of rejecting representative democracy and also alleged that this movement is an upper-caste uprising against India's political democracy. He also claimed that the centralisation such huge powers in Lokapal, which is a non-elected entity will lead the democratic setup to a very dangerous situation. Dalit activist Kancha Ilaiah also commented in a similar fashion, that "The Anna movement is an anti-social justice, manuvadi movement. The Dalits, tribals, OBCs and minorities have nothing to do with it. We oppose it." Another activist Anoop Kheri claimed that "The language, symbols used by the movement clearly reflects its upper caste Hindu nature, a very rightwing Hindu patriotism is being used to get the entire country against corruption. And as a dalit, I have a problem with it." There was also an allegation that an RTI activist was denied permission to protest by having a fast-unto-death at Ralegan Siddhi, the grama sabha stating that the reason was that only Anna Hazare can hold such fasts in his village. During his protest against corruption, another activist, Udit Raj, who was denied permission to protest against Anna Hazare, warned that succumbing to Hazare's demands, which he claimed were against the parliamentary processes will set a dangerous trend rendering the backward classes more vulnerable, as such mass mobilisations coercing the government with a "set of solutions" against constitutional processes could also be used against affirmative action, and is a threat to democracy. Later, it came to light that poor dalits had been paid money of up to 200 each, exploiting their desperation. The participants said that they were asked to shout slogans against Anna, although the organizers have denied it. Some protesters said that they had been told that it was a pro-Anna protest, but feel cheated after realising that it was against Anna hazare. On 22 August 2011 writer-actor Arundhati Roy accused Hazare in a newspaper article of being nonsecular. She questioned his secular credentials pointing out Hazare's "support for Raj Thackeray's Marathi Manoos xenophobia and (has praised) the 'development model' of Gujarat's CM who oversaw the 2002 pogrom against Muslims". The website of the newspaper published many responses to her article and these were mostly critical of her views. Activist Medha Patkar also strongly criticised Roy, saying that her views were misplaced. The Shiv Sena is also facing serious problems from the social activist Anna Hazare who has accused its ministers of corruption and demanded their resignation. The SS-BJP government is facing serious corruption charges and is greatly worried. The Anna Hazare movement began in late November when he went on fast against the corrupt practices of the Shiv Sena ministers. The BJP initially supported the Hazare movement and now its deputy chief minister Gopinath Munde is also under a cloud. Initially the Hazare movement had created a rift between the Shiv Sena and the BJP but with Gopinath Munde himself under a cloud, both may close ranks. The Anna Hazare movement has certainly posed a great challenge for the saffron government at the end of 1996. Hazare was accused of working for RSS and BJP's behest, and against Muslims by cleric Bukhari of the Jama Masjid. Bhukhari was subsequently criticised for being a Royal Imam and the communal comments being his personal views which did not represent the view of ordinary Muslims. Anna Hazare has exposed large corruption in co-operative sugar factories of Maharashtra. One of the sugar factories which Anna exposed corruption of is controlled by Dr.Padamsinh Bajirao Patil, a member of Parliament of 15th Lok Sabha and higher-ranking Leader of Nationalist Congress Party from Osmanabad, and also a prime accused and conspirator in the 2006 murder case of Indian National Congress leader Pawanraje Nimabalkar. The conspiracy to kill Hazare was exposed when Parasmal Jain, an accused in the Nimbalkar murder case, in his written confession before a magistrate said that Padamsinh Bajirao Patil had paid a sum of 3,000,000 (US$57,000) to murder Nimbalkar, and also offered him supari (contract killing sum) to kill Anna Hazare. After this written confession, Anna appealed to the state government of Maharashtra to lodge a separate First Information Report ( FIR ) against Padamsinh Bajirao Patil for conspiring to murder him but the government did not take any action in this regard. Anna Hazare decided to lodge a complaint himself and on 26 September 2009, he lodged complaint at Parner police station of Ahmednagar District in Maharashtra against the Nationalist Congress Party (NCP) MP Padamsinha Patil for conspiring to eliminate him. Padamsinh Patil approached the High Court seeking anticipatory bail but on 14 October 2009, the Aurangabad bench of Bombay High Court rejected the anticipatory bail application of Padamsinh Patil in connection with a complaint filed by Anna after observing that there is a prima facie evidence against him. Padmasinh Patil appealed for an anticipatory bail in Supreme Court of India which the court rejected on 6 November 2009. On 11 November 2009 Padmasinh Patil surrendered before the sessions court in Latur as per a directive of the Supreme Court and was sent to judicial remand for 14 days. On 16 December 2009 Aurangabad bench of Bombay High Court granted bail to him. As of 16 August 2011, the verdict is pending.